Q. I just joined IVAA. Where do I start? Attend one of our New Member Orientations. These are held once a month and provide an overview of the IVAA website and the benefits IVAA offers to our members. Check the Calendar on our website for dates and times, and to register. You might want to think about attending our Monday Coffee Chats to get some information about the industry. These are held every Monday at 10:00 a.m. or 5:00 pm ET and are open to both members and non-members. They are very informal and the topics depend on whatever the group wants to talk about that evening. You can register by going to the calendar on our website at www.ivaa.org/calendar. Expert of the Month – Each month IVAA presents experts on requested topics for the opportunity to continue learning and expanding your knowledge. Resource Recess – These webinars are intended for members to learn a skill in 3-5 steps – new skills to help you with your business – or to learn about a special niche business. Members get access to the recorded events to watch at their leisure. Also, members have access to not only the File Cabinet videos but templates and documents that new VAs can edit which will save them time, etc. Think about becoming a Volunteer for IVAA. IVAA is primarily a volunteer-run organization with many people giving a little bit of their time each week or month in the different departments, such as Membership, Member Benefits, Web Team, and Events. You can meet and work with other virtual assistants, show others the skills that you have to offer, or learn a new skill, such as moderating webinars. For more questions related to getting started with IVAA, please visit our Getting Started FAQ. Q. How do I become a Virtual Assistant or start my business in this industry? Virtual assistants (VAs) are business owners. We recommend that you familiarize yourself with what it takes to run a business. Joining IVAA can help you in both making your decision to become a VA, as well as in supporting you as you run your business. Our feedback is such that our members have the skills and confidence to provide their services at a high level of expertise. There are many VAs that are generalists, providing a variety of different services to their clients; there are other VAs who have established one particular niche. We encourage you to gather as much information as possible about the industry. In addition, and you may want to contact the Small Business Administration office for information on starting a business. Q. Does the IVAA provide work for Virtual Assistants? We often get inquiries about VA training and how to find jobs. IVAA is not a work-at-home job fulfillment service and does not actively find work for our members. IVAA itself does not provide direct VA training for our members, but does provide ongoing educational opportunities through our online and live summits/conferences, expert of the month series and IVAANet listserv. Several of our Preferred Partners provide VA training to our members at a discount. See Member Benefits for more information. We do have a “Request for Proposal” (RFP) system where prospective clients post jobs and our members submit proposals to those job postings. Other ways to find clients including networking, both online (ex. social media) and at local events (ex. chamber of commerce), and by other means of advertising/marketing. Q. Does IVAA offer or find jobs for virtual assistants? 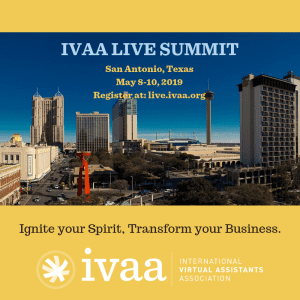 IVAA is a trade association for virtual assistants and provides networking opportunities, discounted education opportunities, and other benefits to our members. As such, we are not a work-at-home job fulfillment service and do not actively find work for our members. We are a volunteer-run organization – the people on our Board and other committees all volunteer their time to the group. We do have a Request for Proposal system whereby those looking to hire a virtual assistant can post their position on our job board and our members can submit proposals to them. Q. What kind of education or networking opportunities may I get from IVAA? Online Summit – In the fall, our online summit gives VAs the chance to attend a wide range of professional and educational sessions without leaving your office. These sessions are available via recording with your paid registration fee. For more information (and to register), go to online.ivaa.org. Live Summit – Each Spring our live Summit takes place in a different city. Members have the opportunity to meet each other in person, network, and participate in an exciting program of presentations and events. This is a “must attend” each year for many members! For more information (and to register), go to live.ivaa.org. Expert of the Month Series – each month, we have an expert in different topics present to our members online. There is generally time for Q and A after the presentation, and the sessions are recorded and available to members to download who were not able to participate. Q. How can I get training as a Virtual Assistant? Q. How can I learn more about IVAA and the benefits for joining? Take a look at the video available on our home page under the “Thinking of Join IVAA? heading.” This video outlines all the member benefits available by joining IVAA. Also, take a look at the Join Now page to get an idea of which benefits are available for each member category, as well as the Member Services page to see a short description of each of the benefits. If you have any additional questions, please contact our membership department. Q. What membership options do you offer? We offer three different membership categories to fit your specific needs: Regular, Trial, and Student. Note that all are individual memberships; we do not offer company, group, or institutional memberships. To compare the benefits each membership offers, please refer to the Join Now page. For a more complete description of each category, click here. Q. Who is the Regular Membership for? What are the benefits of this membership? For a full listing of benefits and a comparison of benefits available to the different member types, please visit the Join Now page. Q. Who is the Trial Membership for? What are the benefits associated with this membership? Trial Membership is for those who want a chance to explore what IVAA has to offer before committing to an annual membership. It gives you a taste of some of our more popular benefits to help you make a decision about upgrading to the regular membership. For rates and specific details about the Trial Membership, visit the Join Now page on the site. Q. Who is the Student Membership for? What are the benefits associated with a Student Membership? IVAA offers a Student Membership category for those people who are currently going to school, such as a college or university, in preparation for starting a business as a virtual assistant. This is a six-month membership that gives students access to a number of our member benefits, including educational activities and preferred partner discounts. To join as a Student Member, please visit our Join Now page. Q. I'm convinced. How do I join the IVAA? Visit the JOIN NOW page and click on the membership type you are interested in to get started. Q. I just joined the IVAA. Where do I start? Attend one of our New Member Orientations. These are held once a month and provide an overview of the IVAA website and the benefits IVAA offers to our members. Check the listings on the right sidebar of our site under Upcoming Webinars for dates and times, and to register. You might want to think about attending our Monday Coffee Chats to get some information about the industry. These are held every Monday at 10:00 a.m. or 5:00 pm ET and are open to both members and non-members. They are very informal and the topics depend on whatever the group wants to talk about that evening. You can register by going to the Upcoming Webinars area of our website. Resource Recess – These webinars are intended for members to learn a skill in 3-5 steps – new skills to help you with your business – or to learn about a special niche business. Q. I received an email stating my membership is going to expire in 30 days. If you do not want to have your account on auto-billing, please contact the Membership Dept. from our Contact Us page. Q. I just got a “Renewal Reminder,” where do I renew my membership with IVAA? How can I upgrade from a Trial Membership to a Regular Membership? In order to upgrade, please contact our Membership Dept. from our Contact Us page and you will be provided with a link to an order form that you can use to submit your payment. Q. How do I change from annual to quarterly or semi-annual payments, or vice versa? Please contact our Membership Dept. from our Contact Us page to make this change. When are the IVAA Board Meetings? How can I attend? If you would like to know about the inner workings of IVAA, you can attend IVAA Board meetings. IVAA Board meetings are open to all members, but are not open to the public. To really see a return on your membership investment, participate in one of several IVAA committees. Log in to the website and go to the Calendar and review the dates and times of upcoming meetings. What are the Coffee Chats? How do I sign up for the Coffee Chats? In order to directly speak with some virtual assistants, you may want to consider attending one of our Monday Coffee Chats held every Monday at 10:00 a.m. or 5:00 pm EST and are open to both members and non-members. These are informal calls and the topics depend on whatever the group wants to talk about that evening, and you may gain some valuable information from these calls. You can register by going to our website at www.ivaa.org and clicking on the calendar link on the right-hand side of the page. If you don’t see the Coffee Chat listed, just click on the “More” button to get the full calendar. What is the Expert of the Month series? Where can I view recordings of previous EOM sessions? The driving force behind the IVAA Expert of the Month Sessions is the idea that everyone, newbie or seasoned VA, has expertise they can share with others, whether it is hardware, software, marketing, website design, or industry-related skills. Attend our Expert of the Month sessions and consider signing up to hold your own. Share your experience and knowledge with others. For more information, go to Member Services, Events, Expert of the Month –http://www.ivaa.org/?page=ExpertoftheMonth . Expert of the Month sessions are recorded, and the recording are available to Regular Members. Live Summit – Our Live Summit takes place in a different city every other year in the Fall. Members have the opportunity to meet each other in person, network, and participate in an exciting program of presentations and social events. This is a “must attend” each year for many members! For more information (and to register), go to live.ivaa.org. Online Summit – Offered every other year in the Fall, our Online Summit gives VAs the chance to attend a wide range of professional and educational sessions without leaving their office. These sessions are also available via recording with your paid registration fee. For more information (and to register), go to online.ivaa.org. What is a Virtual Assistant Connection? How do I find one in my area? If you love being virtual – but not all of the time – then a VA Connection is for you. A VAC (Virtual Assistant Connection) is an opportunity to meet face-to-face with other VAs in your area. Veterans, new VAs, emerging VAs, and those considering a career in virtual assistance, meet to break bread and discuss the virtual assistant life. IVAA members host these events, which usually occur quarterly. They are a great way to build a network of friends who share your passion. Many have “been there – done that” – and here’s the best part – they’re willing to share their knowledge because they know they will learn something new as well. For more information, go to Member Services, Local VA Groups or go to Local VA Groups. You might want to think about attending our Monday Coffee Chats to get some information about the industry. These are held every Monday at 10:00 a.m. or 5:00 pm EST and are open to both members and non-members. They are very informal and the topics depend on whatever the group wants to talk about that evening. You can register by going to our website at www.ivaa.org and clicking on the calendar link on the right-hand side of the page. Our Live Summit is held yearly in the spring and is a great opportunity for you to network with your peers and get some great information about what it means to be a VA. You would also meet many people in various stages of their businesses. It is not necessary to be a member to attend the Summit, although members pay a lower registration fee. Our Online Summit is held once a year in the fall. This Summit is a great opportunity for those who are unable to attend the Live Summit but still want to reap the benefits of the networking as well as the training and resources offered from seasoned and knowledgeable speakers, helping you drive your business in the right direction. We highly recommend that you sign up for IVAA Facebook Group, our Facebook Group is for IVAA members to discuss many topics relevant to the VA industry. This is consistently voted our #1 benefit. Not only are the current posts very helpful but the archived posts provide a lot of great information as well, especially for people just starting out. Once you sign up to become a member, you can request to be added to the Facebook Group. Q. What is the New Member Orientation? Orientations are usually done once a month from 1:00-2:00 p.m. EST. Should your schedule not permit attending one of these orientation sessions, we have a PowerPoint file and a recording of one of the New Member Orientations available. A recording of the New Member Orientation as well as the Power Point slides that are presented during the session are available on our website. The IVAA Facebook group is consistently ranked as one of our top benefits, providing a lot of valuable information through members posting questions and others responding. It is a forum for IVAA members to discuss many topics relevant to the VA industry. This is consistently voted our #1 benefit. Not only are the current posts very helpful but the archived posts provide a lot of great information as well, especially for people just starting out. IVAA lets all members shine by allowing them to be themselves. To participate in the IVAA Facebook group, please sign to become a member. Once your information is verified, you will be added to the group. Online Summit – Our online summit gives VAs the chance to attend a wide range of professional and educational sessions without leaving your office. These sessions are available via recording with your paid registration fee. For more information (and to register), go to online.ivaa.org. Live Summit – Our live Summit takes place in a different city. Members have the opportunity to meet each other in person, network, and participate in an exciting program of presentations and events. This is a “must attend” each year for many members! For more information (and to register), go to live.ivaa.org. Expert of the Month Series – each month, we have an expert in different topics present to our members online. There is generally time for Q and A’s after the presentation, and the sessions are recorded and available to members to download who were not able to participate. There are many avenues a Virtual Assistant can pursue for education. IVAA has a new program called “Training, Resources and Tools” which can be found under the Member Services menu that will list recommended sources for training. We also provide resources and tools (including free tools) that have been recommended by your peers that help them grow their business. Q. What discounts do I get as an IVAA member? Q. What’s available in the File Cabinet & Forms Library? In the Forms Library, Regular Members have access to many sample documents and templates, such as business plans, accounting, client agreements and contracts, client forms, employment, timesheets, etc. IVAA assumes no responsibility for any losses incurred as a result of the use of the forms. IVAA also does not endorse any particular form. These documents are meant for example purposes only. Any legal agreement should be reviewed by a qualified attorney for enforcement. IVAA’s premier monthly newsletter gives you unique perspectives from VA pros in the industry. IVAACast keeps you up-to-date with the latest tools, tips, technology, events and more! Discounted advertising opportunities are available. To subscribe up, go to ivaacast.org. Q. How are our members dues allocated? IVAA is a registered non-profit with the IRS and is listed on www.GuideStar.org. IVAA is overseen by a Board of Directors, and members vote on the by-laws and for those who serve on the Board. Membership dues are used for the operations of the organization, which include but are not limited to paid service providers for specific professional services, marketing, member recruitment, technology for meetings and members services, and membership software and website, as well as storage of our “File Cabinet” (videos, forms, audio recordings, etc.). The help from our numerous volunteers helps defray additional membership costs. Q. How do I change my username and/or password for the IVAA website? Log in to the Members Area with your User Name and Password, by choosing Log In in the upper right corner of the website. Click Edit Profile. Under Your Membership, Click the Change your Password hyperlink. Q. How do I update my member profile in the IVAA Directory? Click Edit Profile. Scroll to the areas in your profile and update your information where needed. Click Submit at the bottom of the page. Q. How do I update or modify the services on my profile in the IVAA Directory? Q. I am not able to reset my password to sign in to the new IVAA website? Request a password reset on the login page to receive an email with instructions. Q. Can I receive email alerts of new RFPs? Login into the site and click the tick box in your profile to receipt RFP Notifications. Q. Why does my profile say that it is hidden from others? Only profiles of Regular Members are visible to other members or the public viewing our directory. If you are an Emerging or Student Member, you should see this message. If you are still seeing this message after you have upgraded your membership, please contact the Web Department and we will look into the issue. The IVAA website uses a service that allows us to load specific fonts on our website that would not otherwise be available. This script is not hosted on a secure server and will generate the browser warning that “this page contains both secure and nonsecure items”. We have tested every page of the registration and payment process, and the only nonsecure item on these pages is the script for the fonts. If you are more comfortable, you may choose to not display the nonsecure items and your viewing and user experience should not be severely impacted – the fonts might look a little different, but that should be the only difference. Q. Where is the Member Logo?